It’s an exciting time when you’re ready to take your product, app or service to market. By this stage you should have found a market where your business can generate value. Now all you have to do is sell it and earn a profit. A key component of any company’s business model is choosing an effective strategy for how exactly you’ll generate revenue. Choosing the right start-up revenue model will allow you to grow fast and earn a large profit. Here are 12 of the most popular and effective start-up revenue models. An offering where a companies basic services are free of charge, but a premium is charged for additional features, extensions and functions. A couple of well renowned companies to use this strategy are LinkedIn and MailChimp. A subscription is a recurring revenue strategy, where customers are charged upfront for periodic use or access to the service. This is a popular strategy used among entertainment services like Netflix and Amazon Prime or SaSS products such as Office 365 and Salesforce. Customers have access to potentially unlimited services and features and only pay for what they use. It’s a commonly used revenue model within the telecom and cloud-based service industry. This licensing model grants permission to use a companies products, services or name at a predetermined or recurring cost. It’s common among creators, inventors and intellectual property owners such as Disney, Ferrari and the BBC. With an advertising approach the offering is absolutely free, and the emphasis is on the sale of advertising as a major source of revenue. It’s a popular solution among traditional broadcast, print media as well as online media companies such as YouTube and countless mobile applications. Franchising can help you grow your business by selling the rights to use your brand and business model, instead of investing in new units of your own. The franchisee would use your successful business model in return for a fee – typically a fixed starting fee plus a commission from the income. McDonalds are the masters of this, attracting their first franchisee for their unique restaurant concept in 1952, today they have over 31,000 franchises in 119 countries and serve 47 million customers a day. Uses past data, customer profile or performance to determine a future-price offering. This strategy is commonly used by insurance companies, for example if you have a negative history your cost will be higher. Aviva have invested heavily in Aviva Drive, an app that sends them data about how you drive – helping them better tailor their predictive pricing. A popular strategy used within the online marketplace is the affiliate revenue model. An individual or brand promotes to their audience links to relevant third party products and charges commission or a fixed rate for every transaction. According to the level of demand, customer or conditions the price of the offering can change accordingly. For example, an airline will change their prices according to their current demand and American energy company ComEd have recently introduced real time pricing based on current energy demand – leading to a 15% reduction on customers bills. By lowering the cost of production you can produce more, and take advantage of economy of scale, as a result this will lower the cost per production unit which you can pass onto your customer. Normally applied for prestigious, luxury or niche products and services. Brand image and quality is an important element for premium revenue models. Some examples of well renowned companies to use this strategy include Rolls-Royce, Gucci and Rolex. 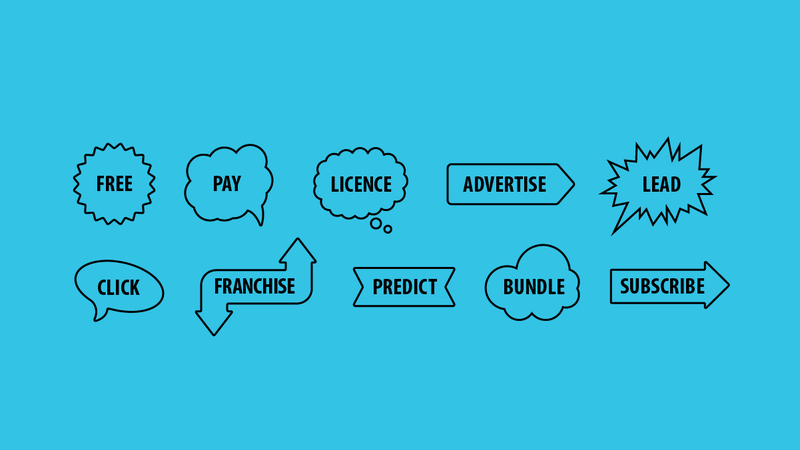 Bundle pricing offers several products or services as a combined product for a lower price. Some common examples include value meals at restaurants, utility companies and software. For example Office 365 offers you Word, Excel, Powerpoint, Outlook, OneNote, Publisher and Access, all included for one price. Often two or more of these models are used in conjunction with each other – for example Spotify benefit from a freemium and subscription model. While Volvo now run a “car as a service” model that incorporates a fixed monthly subscription for the car and all expenses, such as insurance and servicing, with the option to add premium features on a pay-per-use basis. There are of course many more types of revenue model, but hopefully the twelve we have highlighted in this article will give you a good place to start.